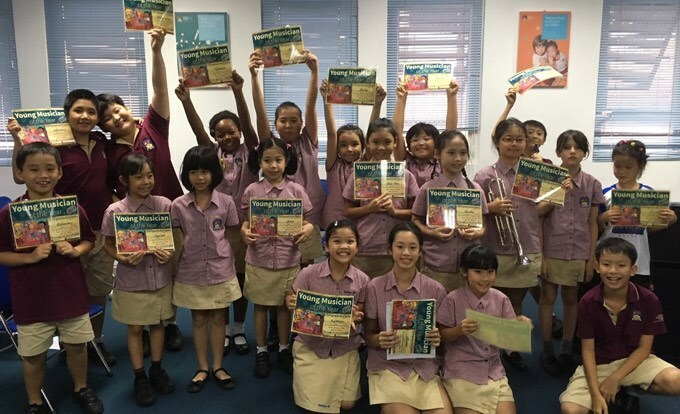 As we approach the half term break, many classes are coming to the end of their IPC (International Primary Curriculum) topic. Two of the key elements of the IPC is that the topic begins with a motivating and inspirational ‘entry point’, and concludes with an ‘exit point’. The exit point may be an event that the learning has been building towards, or an exhibition, display, performance or activity that incorporates learning from the unit. As well as drawing the IPC topic to a close, the ‘Blast Off’ project gives children an opportunity to design and build an object, and then test it to see if it works. In recent years, this sort of activity would come under the heading of a STEAM project. STEAM stands for Science, Technology, Engineering, Arts and Maths. Rather than being taught as separate topics, STEAM activities, like the ‘Blast Off’ project, require different elements of the curriculum to be combined and applied to achieve the desired outcome. We certainly saw great results last Friday. Expectations of schools, teachers, and students have never been higher. These expectations demand that our students are being prepared for an ever changing world, where many of the jobs that they will be undertaking may not even exist yet. So how do we at BIS prepare students for the unknown…. 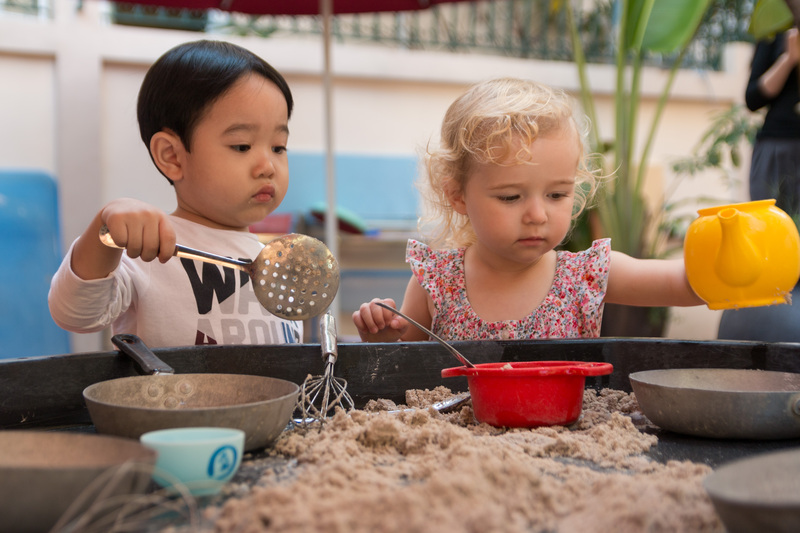 well by recognising the importance of fostering our students BIS Learning Skills and creating environments that allow them to apply their skills of communication, collaboration and critical thinking in a variety of situations. Nowhere better can this be seen than in the new Design Technology suites that have been developed and installed over the summer break. 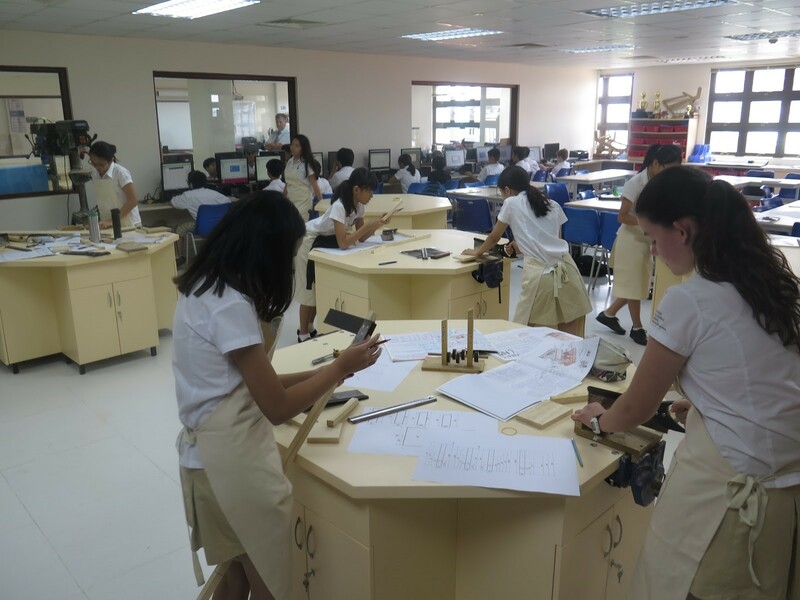 The new, open plan workshops are designed to allow students far more independence and influence over their own learning by creating spaces that facilitate the transition between investigating, designing and experimental learning. The DT labs are equipped with high quality learning technologies including 3D printers and laser cutters to support students’ manufacturing of their designs. They are also now complemented by a CAD/CAM suite, a Makerspace area which will be used by a variety of STEAM subjects as well as a new pc suite. As a whole the Design suite now offers students a wealth of creative opportunities for designing and creating exciting and innovative products. 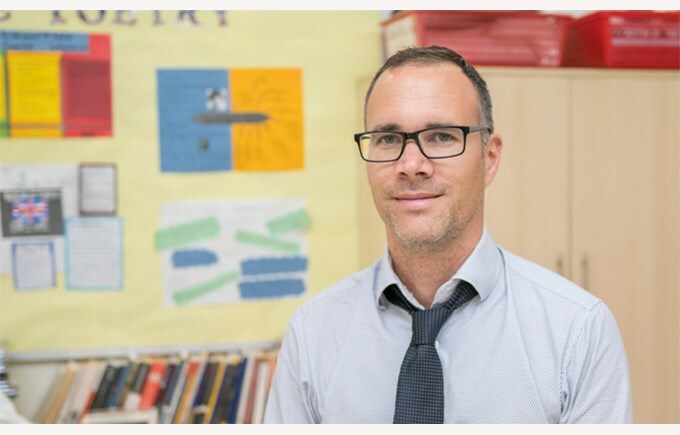 In primary, Mr Luke who currently teaches ICT at the An Phu Primary campus, has recently expanded his role to be ICT and Design Technology leader over all of primary. He is very keen to see this same project-based approach for our children. Instead of STEAM, he has DREAMS! Design, Robotics, Engineering, Arts, Mathematics and Science. This element of our curriculum is currently being developed and Mr Cian, who works very closely with Mr Luke, will be introducing TX children to DREAMS in the near future. For those of you who use Twitter, you can follow Mr Luke’s developments; @BIS_DREAMSLab. 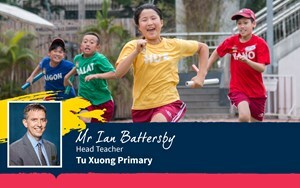 Look out for Mr Luke’s post next week which will give more details about the DREAMS initiative. We have a clear ‘STOP, DROP and GO’ rule for Tu Xuong Street, because we need to keep the traffic flowing and the children safe. It only takes one driver to not follow the rules and everyone else will be stuck in a traffic jam, or worse, a child may be injured. Ask your driver to show respect to our guards and follow their instructions – they are there to keep you all safe and have a difficult job when drivers ignore their instructions. Explain to your driver that their actions reflect upon your family – ask them to respect all of our school community to make our school the very best that it can be. 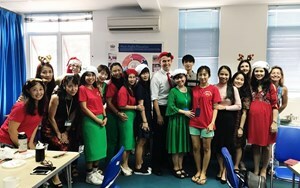 Yêu cầu tài xế tôn trọng các bảo vệ và tuân theo chỉ dẫn của họ – các bảo vệ có trách nhiệm bảo đảm an toàn và sẽ gặp khó khăn trong công việc nếu tài xế phớt lờ các chỉ dẫn của họ. Giải thích với tài xế rằng hành động của họ phản ánh gia đình của bạn – yêu cầu tài xế tôn trọng cộng đồng nhà trường để trường BIS trở nên tốt nhất có thể. Last year our Milepost 3 children began a programme called ‘Let’s Think in English’. It applies the same principle that lays the foundation for Talk for Writing, namely, that in order to write, children first need to talk. Teachers introduce the children to challenging stories and situations and then guide the children’s discussions through targeted questions which require a higher level of thinking. Michael Walsh, the professor at King’s College London, who devised the programme, returned this week to provide additional training to our Milepost 3 teachers. *This year we are changing the way we assess and report children’s attainment and progress. We had originally planned to present this information to you on Wednesday 18th October, but following a discussion with Mr Simon, we felt it would be best to present this during the Headteacher’s coffee mornings at the beginning of November. We will be presenting the same information 3 times; at TX on Wednesday 1st November, then twice at the An Phu campus on Thursday 2nd November. Please join us at the location and time that is most convenient for you. The Book Swap closed on Monday this week and the Parent Group are now busily arranging, along with the Community Department, where to donate the titles that we have left. Thank you to all children and families who took part in this successful event. Next week brings the first of the Parent lunches organised outside of school for all parents to join. Please click the link to read more in this week’s Parent Corner. Please join us for a Family Evening on 11th November 2017. The family evening is a fun event and an opportunity for the parents, teachers and children to come together as one community. 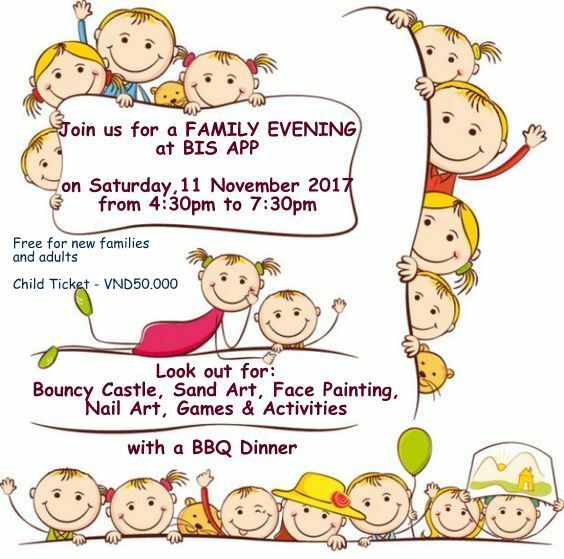 It is also a time for BIS to welcome all new families and children in an informal gathering. The Family event, previously conducted in the mornings is well attended by over 700 people. The highlights for this evening will include Bouncy Castle, Sand Art, Face Painting and other Games and Activities, alongside a BBQ Dinner. It is free for all new families and adults; children’s tickets are 50,000VND. Tickets will be available for sale from Gate A, the Canteen at APS and the office at TX from 1st November 2017. Fundinotots is open to all children aged between 0 and 36 months. Please note that Fundinotots is only open to children accompanied by parents or other family members, not nannies, except for our Friday session. Friday 8:00 – 10:00 a.m.
Fundinotots meet in the Early Learning Centre at An Phu Primary Campus, District 2. Click here to download the Fundinotots Application Form. Click here to find out more about Fundinotots. BIS are pleased to advertise the up-coming Autumn Holiday Sports Camps, to be held at the three BIS campus, during our half term break (Mon 23rd – Fri 27th October). This year is action packed with football, volleyball, basketball, mini tennis, multi skills/skills factory, t-ball/softball, swimming and junior master-chef on offer from providers such as Rising Stars Football Academy, FOX, SSA, Richard Soriano, Vinh Nguyen and Junior Chef Saigon. Please see the following poster for a full list of camps on offer. Please print the appropriate letters (sent previously via email) and return reply slips, along with the full fee, to the cashier of your school no later than Friday 13th October to secure your child’s place. After what was without doubt the most difficult decision I have had to make at Tu Xuong, congratulations to Tadala, Johnny and Dolly who won a place in the final of the Young Musician of the Year competition on Thursday after school. 20 children performed in the semi-final, and it fell to Ms Hayley, Ms Jules and myself to select only three to go through. The standard was so high and once again I was left feeling incredibly proud of the effort of the children at TX who have practised hard and had the confidence to stand (or sit) in front of their parents, teachers and friends, to play their pieces. I do hope many of you will be able to join us on Tuesday 17th October for the final of the Young Musician of the Year competition at 6pm in the An Phu Secondary school theatre (on the sixth floor). Anne Salapete updates TX parents about current events in the Parent Group.